Spiral Stairs are practical, structurally sound, easy to install, cost-efficient, and space-saving. The spiral stair seen in this picture of a tire manufacturing plant in the Midwest, connects two floors for quick employee movement. It was designed to free-stand at 20'. This customer had enough room to install the staircase in one section. The spiral stair has a 6’ diameter handrail on both the outside and the inside at the column. This makes it a comfortable and safe spiral stair to walk. 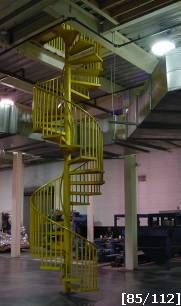 If your job site area is small, a long spiral stair can ship in multiple sections or we can manufacture as a bolted spiral stair in order to ease installation.